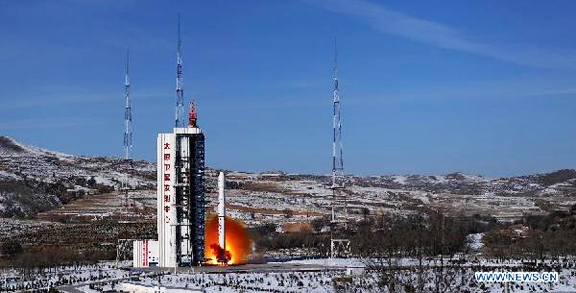 .... a high-resolution remote-sensing satellite, from the Taiyuan Satellite Launch Center in northern Shanxi province. Launched at 11:26 a.m aboard a Long March 4B rocket, the satellite reached an orbit of 770km above Earth about 13 minutes later, according to the launch center. Developed and produced by the China Academy of Space Technology, a subsidiary of China Aerospace Science and Technology Corporation (CASC), it is the country's first such orbiter that can acquire high-resolution data through remote-sensing, marking a key technological leap forward. Carrying China's "Ziyuan I" 02C satellite, a Long March 4B carrier rocket lifts off from the Taiyuan Satellite Launch Center in northern China's Shanxi province, Dec. 22, 2011. China successfully sent the high-resolution remote-sensing satellite into space on Thursday. The satellite will be used to conduct surveys on land resources, help with natural disaster reduction and prevention and so on. According to the center, the satellite can conduct land resources surveys, reduce natural disasters, aid agriculture development and manage water resources. The Long March 4B rocket is developed by Shanghai Academy of Spaceflight Technology, another CASC subsidiary. Thursday's mission marked the 155th flight of China's Long March series of carrier rockets.